The court denied defendant's motion to strike the declaration of plaintiff's claim construction expert and rejected the argument that the expert relied on an improper indefiniteness standard. "The distinction that the defendants draw between the Supreme Court’s standard and the standard articulated in [plaintiff's expert's] declaration is a narrow one. [Plaintiff's expert] understood that a claim is not indefinite 'if a person of ordinary skill in the art would understand the scope of the claim.' The Supreme Court [in Nautilus, Inc. v. Biosig Instruments, Inc., 134 S. Ct. 2120 (2014)] held that a claim is not indefinite if the claim would 'inform those skilled in the art about the scope of the invention with reasonable certainty.' This Court does not regard the difference between those two standards as being significant. To say that a person of ordinary skill would understand the scope of the claim implies that the claim would inform such a person of the scope of the claim with reasonable certainty." The court denied defendant's motion to dismiss plaintiff's declaratory relief claims for lack of subject matter jurisdiction. "Plaintiff has not alleged that defendant communicated with plaintiff at all before initiating this lawsuit. Nevertheless, plaintiff demonstrates that defendant has 'engaged in a course of conduct... show[ing] a preparedness and willingness to enforce his patent rights.' Indeed, defendant has: (1) identified the [patent-in-suit]; (2) asserted he is the owner of the [patent]; (3) identified plaintiff’s competing product . . . (4) asserted that plaintiff’s 'design' . . . is 'a copy of the [product covered by the patent]'; and (5) sued others in the past for purportedly infringing on his [patent]. . . . [D]efendant fails to cite any authority establishing that a two (or three year old) assertion, proffered as evidence, necessarily becomes stale. Indeed, the Court finds that the passage of time does not, by default, deprive this Court of declaratory judgment jurisdiction since the relevant circumstances of this case have not changed despite the passage of time. Put simply, defendant’s previous statements continue to validate plaintiff’s reasonable apprehension of being a possible infringer even though defendant is not currently 'poised on the courthouse steps' to sue plaintiff for infringement . . ."
Following summary judgment, the court denied defendant's motion for attorneys’ fees under 35 U.S.C. § 285. "Defendants argue that [plaintiff] knew or should have known that Court’s First Claim Construction Order was dispositive of all of [plaintiff's] infringement theories. Therefore, Defendants argue that [plaintiff's] decision to continue litigation in the district court rather than enter into a stipulated judgment and seek appeal to the Federal Circuit renders this an 'exceptional' case. Defendants offer somewhat probative circumstantial evidence suggesting that [plaintiff's] motive was only to delay the impact of the Court’s order on its related litigation over this patent in other districts. . . . Patent litigants often disagree about whether a plaintiff has viable infringement contentions after an adverse claim construction, and one side is usually wrong. . . . Moreover, [plaintiff] achieved favorable results in other litigation over the [patent-in-suit] even after the courts in those cases construed the 'transferring . . . if' terms the same way this Court did. While Defendants point out valid distinctions between those cases and this one, this fact makes it difficult for the Court to conclude that it was 'extraordinary' for [plaintiff] to continue to pursue its infringement allegations after claim construction. This presents a very close case." Following a bench trial on damages, the court found defendant's expert's damages model to be unreliable. "[T]he primary problem with [defendant's] damages model is the fact that it bases royalties on chip prices. [Plaintiff] did not invent a wireless chip. Although it is largely undisputed that the inventive aspect of the [patent-in-suit] is carried out in the PHY layer of the wireless chip, the chip itself is not the invention. . . . Compounding this problem is the depression of chip prices in the damages period resulting from rampant infringement which occurred in the wireless industry. Prior to 2008, outside of the [a single entity], no company in the industry sought a license from [plaintiff] to the [patent-in-suit] and [plaintiff] received no royalties whatsoever for that technology. It is simply illogical to attempt to value the contributions of the [patent-in-suit] based on wireless chip prices that were artificially deflated because of pervasive infringement. Basing a royalty solely on chip price is like valuing a copyrighted book based only on the costs of the binding, paper, and ink needed to actually produce the physical product. While such a calculation captures the cost of the physical product, it provides no indication of its actual value." The court denied defendant's motion to preclude plaintiff from asserting any proposed claim constructions or in the alternative to comply with the court's rules regarding the exchange of proposed terms. "[Plaintiff] has apparently taken the position that no terms need construction. That is [plaintiff's] right. However, to ensure no 'gaming' of the process, the Court does not require the parties to meet and confer on claim construction. They may rely on previously identified (per this Court's rules) intrinsic and extrinsic evidence submitted (if any) in support of their positions. However, [plaintiff] (for instance) may not now offer an alternative construction for claims it stated needed no construction. Similarly, [plaintiff] is limited to the intrinsic and extrinsic evidence it has already proffered (if any) in support of its position. . . . The Court is troubled by assertions that there is a 'gaming' of the system. Let's be clear: [plaintiff] is plaintiff and bears the burden of going first - and showing its cards - more frequently than the defendants. That comes with the territory as plaintiff. The Court assumes good faith and that each party being told now to stick with its stated positions will be neither surprised nor prejudiced by so doing." The court denied in part defendant's motion to dismiss plaintiff's declaratory relief action for lack of subject matter jurisdiction. "[Defendant] contends that this Court lacks jurisdiction because, in its pre-suit communications, it did not name any specific [plaintiff] products or services. . . . [Defendant] repeatedly asserted that features of [plaintiff's] products infringe specific [defendant's] patents, provided a detailed chart comparing these patents with [plaintiff's] features, and implicitly — but clearly — threatened to sue [plaintiff] based on these features. This is sufficient to establish an actual controversy over which there is federal jurisdiction." The court granted plaintiff's motion for summary judgment that its tooth whitening patents were not invalid as obvious in light of prior art patents based, in part, on the PTAB's findings during inter partes review. "[U]nder this 'reasonable likelihood' standard, which is significantly lower than the 'clear and convincing' burden in this litigation, the PTAB found that [defendant and its expert's] inherency arguments were insufficient. . . . The PTAB rejected [defendant's] inherency arguments, under a lower standard of proof, not once, but twice. . . . [Defendant] directed its requests for rehearing almost exclusively to the PTAB’s rejection of the . . . inherency arguments [regarding the limitations at issue]. In both instances, the PTAB rejected [defendant's] requests, confirming its ruling that [defendant] had failed to show a reasonable likelihood that it could prove, by a preponderance of the evidence, that [three prior art patents] inherently disclose the [limitations at issue]." The court denied defendant's motion to stay pending inter partes review because of the undue prejudice to plaintiff. "Third parties have already unsuccessfully challenged these patents in a previous IPR proceeding. Now, five months after that denial, other parties have filed a successive IPR petition with similar claims. . . . Any delay of this kind is inherently prejudicial to Plaintiff’s right to pursue its claims. . . . [B]ecause the PTAB has already denied challenges to the patents in the first IPR proceeding, it would seem even less likely that the current petition would succeed. . . . If the PTAB should issue a decision which changes any of these assumptions or the status of the overall disputes, then the Court can certainly review this denial. In the meantime, the Court’s judgment is that the parties should reach agreement on an appropriate litigation plan and proceed with it." The court granted defendant's motion to exclude plaintiff's damages expert from trial for failing to comply with Rule 26 regarding the contents of his report. "The report prepared by [plaintiff's expert] provides virtually none of the information required by Rule 26 (a)(2)(B)(i). Plaintiff's response to the motion asserts as an excuse for noncompliance lack of sufficient discovery before [its expert] prepared his report for him to have the information he would need to comply with the requirements of Rule 26(a)(2)(B). . . . Plaintiff had ample time before [its expert] prepared and submitted his report for the collection of whatever information it needed for [him] to provide the information in his report. . . . The court has concluded that no lesser sanction would adequately address plaintiff's failure to comply with the scheduling order as to [plaintiff's damages expert]." The court granted in part a customer defendant's motion for summary judgment of patent exhaustion following plaintiff's offer of a covenant not to sue to defendant's manufacturer. "[Plaintiff's] offer of a covenant not to sue [the manufacturer] is an 'authorized sale' within the meaning of the patent exhaustion doctrine, as to the [patent-in-suit]. It is undisputed that [plaintiff] offered [the manufacturer] a covenant not to sue during the proceedings on [the manufacturer's] declaratory judgment action. [Plaintiff] cannot retract its admission in this case. The offer of a proposed covenant not to sue shows [plaintiff's] intent to allow [the manufacturer] to use and employ the patented practice while promising not to sue for infringement. [Plaintiff's] stated intent to prevent any rights under the covenant to extend to [the manufacturer's] customers is not a relevant consideration under a patent exhaustion analysis. Consequently, [the manufacturer's] downstream customers, like [defendant], have the right to practice the patent through the doctrine of patent exhaustion." The court gave an indicative ruling that if its denial of plaintiff's motion for attorneys' fees under 35 U.S.C. § 285 was remanded for reconsideration following the Supreme Court decisions in Octane Fitness, LLC v. Icon Health & Fitness, Inc., 134 S. Ct. 1749 (2014); and Highmark, Inc. v. Allcare Health Mgmt. Sys., Inc., 134 S. Ct. 1744 (2014), it would deny the motion. "Considering the totality of the circumstances, given that the 'evidence was close' and the litigation misconduct was 'modest,' there is not a sufficient basis to conclude that Defendants maintained an exceptionally weak litigating position or advanced exceptionally meritless claims." Following the Supreme Court's decision in Octane Fitness, LLC v. Icon Health & Fitness, Inc., 134 S.Ct. 1749 (April 29, 2014), the court granted plaintiff's motion to reconsider an earlier order denying plaintiff's motion for attorneys’ fees under 35 U.S.C. § 285. "Under the discretionary, flexible framework endorsed by the Supreme Court, the Court finds that this case is exceptional within the context of § 285. The Court does not alter its previous finding that there was no evidence of bad faith or litigation misconduct. . . . However, contrary to [defendant's] argument, Octane Fitness makes clear that these findings are not required for an award of fees under § 285. Rather, employing the more flexible approach embraced by the Supreme Court, the Court finds that this case 'stands out from others with respect to the substantive strength of [defendant's] position.' This is not to say that [defendant's] decisions to file infringement counterclaims and pursue litigation were necessarily objectively baseless. . . . The Court, however, finds that this case is uncommon based on the absence of evidence supporting [defendant's] theories of infringement at summary judgment. . . . Despite ample time to obtain evidence supporting its theories of infringement, the only evidence [defendant] submitted to support its claims were excerpts from websites purportedly explaining the effects of stress on different materials." The court denied without prejudice defendant's motion to stay pending inter partes review because it was premature, but maintained the discovery stay pending the PTO's decision on the petitions for review. "While the approach taken by courts varies, a recent decision from this District held that the court would not address the defendants’ motion to stay pending IPR until after the PTO actually rendered a decision granting such review. There, like here, the defendants had applied for IPR, but such review had not yet been granted at the time the defendants moved to stay the underlining action. In light of this decision, the Court agrees with [plaintiff] that [defendants'] application to stay pending IPR is premature. . . . The Court finds that it would be inefficient to reopen discovery at this juncture given the fact that the PTO has at most 27 days to render its decision as to whether to grant the review requested by [defendants]." The court denied plaintiff's motion for new trial even though there was clear and convincing evidence that defendant's expert gave false testimony. "[Plaintiff] asks this Court to set aside the judgment based on the newly discovered evidence that [defendant's expert] lied about his qualifications and about performing tests. . . . There is heightened concern here because [defendant's expert] was a retained expert, solicited and sponsored by [defendant] in a patent case in which expert testimony was critical. . . . Regardless of the seriousness of [his] offense, however, [plaintiff] still must demonstrate that a new trial would probably produce a different result. Upon sober reflection, I conclude it cannot do so. . . . [W]hile there is no way for the Court to recount the whole of the evidence adduced at trial, there was strong evidence to support [plaintiff's] non-infringement case, independent of [defendant's expert] testimony." The court granted defendants' motion to supplement their claim construction briefing with an expert declaration following the Supreme Court's decision in Nautilus, Inc. v. Biosig Instruments, Inc., 134 S. Ct. 2120 (2014). "The Court expects that indefiniteness arguments will be substantial at the upcoming Markman hearing. . . . [Defendant's] argument is that this new standard of proof, which requires 'reasonable certainty' as opposed to a mere determination that a claim is not 'insolubly ambiguous,' benefits from an expert’s opinion in a way that the previous standard did not. [Defendant] reasonably asserts that an expert declaration could be beneficial in assessing whether a claim informs a skilled artisan with reasonable certainty. . . . The Court is not holding that expert testimony is required or necessary for the upcoming Markman hearing. . . . The Court is simply holding that [defendant's] argument that it wishes to present expert evidence based on the new Nautilus standard is reasonable." The court denied without prejudice defendant's motion to stay pending CBM review and rejected defendant's argument that stay should be nearly automatic. "[Defendant] argues that strong language in the legislative history indicates Congress’s intent to 'place a very heavy thumb on the scale in favor of a stay being granted' to the point that 'it is nearly impossible to imagine a scenario in which a district court would not issue a stay.' However, Congress did not provide an automatic stay provision. . . . Whether to ultimately grant or deny such a stay flows from the court’s inherent authority to manage its own docket. The Court declines to rely on statements in the legislative history cited by Defendants that imply a stay should almost always be granted. The statutory text is unambiguous about what factors to apply and does not reflect the idea that a stay should almost always be granted." The court denied defendant's motion for sanctions under 28 U.S.C. § 1927 because counsel's assertion of an indirect infringement claim, after defendant filed a motion for summary judgment and plaintiff dropped its direct infringement claim, was reckless but not frivolous. "[Plaintiff's] counsel recklessly asserted an indirect infringement claim unsupported by any evidence of direct infringement. [Plaintiff's] reckless claim, however, was not frivolous. First, the ultimate result of the case was not obvious to [plaintiff's] counsel because he formed a good-faith (albeit incorrect) belief that he had sufficient evidence to establish indirect patent infringement. Second, the arguments advanced were not wholly without merit, considering that [plaintiff] obtained an expert who opined that [defendant's] Enabled Usage falls within [the patent-in-suit]. . . . [Plaintiff's] counsel conducted prefiling investigations and formed a good-faith belief that it had a valid infringement claim. [Plaintiff] made no attempt to extort money from [defendant], never offered a settlement demand to obtain a nuisance settlement, nor did it coerce [defendant] to settle under the threat of protracted litigation." The court sua sponte severed all of plaintiff's infringement claims against more than 80 defendants into separate actions because of judicial economy. "The Court’s [order to show cause] expressed two concerns underlying its suggestion for total severance: (1) that competitor defendants not be joined in the same action in violation of 35 U.S.C. § 299; and (2) that the claims against the downstream retailer defendants should be stayed pending resolution of the claims against the upstream defendants. The latter concern is based on the 'peripheral nature' of the claims against the downstream retailer defendants and on the fact that 'some of defendants have agreed to indemnify other defendants, particularly those downstream in the stream of commerce.'. . . The fact that some defendants that Plaintiff seeks to join in one lawsuit are not competitors and that some defendants have consented to joinder does not convince the Court to permit such joinder. . . . Plaintiff, by filing claims against over eighty defendants in twelve lawsuits, has placed an undue burden on the judiciary and the Clerk of the Court by seeking relief under only twelve docket numbers and paying only twelve filing fees." The magistrate judge recommended denying defendant's motion to reconsider an earlier order denying defendant's motion for attorneys’ fees under 35 U.S.C. §285. "In granting [defendant's] motion to submit . . . supplemental authority, I asked the parties to address whether [Octane Fitness, LLC v. ICON Health & Fitness, Inc., 134 S.Ct. 1749 (2014)] and [Highmark, Inc. v. Allcare Health Management System, Inc., 134 S.Ct. 1744 (2014)], 'preclude consideration of [defendant's] litigation conduct (or misconduct) in determining whether attorneys’ fees should be awarded." . . . While [defendant] admits that the court 'is free to consider . . . the conduct of both parties' in determining whether this is an 'exceptional case', it argues that the court should 'primarily focus its inquiry on an objective assessment of the substantive merits of [plaintiff's] position, and . . . that consideration should be given the most weight'. I disagree. . . . One of the 'traditional principles of equity' is that 'he who comes into equity must come with clean hands'. 'This maxim necessarily gives wide range to the equity court’s use of discretion in refusing to aid the unclean litigant.' '"[U]nclean hands" really just means that . . . the plaintiff’s fault, like the defendant’s, may be relevant to the question of what if any remedy the plaintiff is entitled to.' . . . Given [defendant's] own litigation misconduct, it does not have 'clean hands' sufficient to render this an 'exceptional case'." The court granted in part defendant's motion to reconsider an earlier claim construction order in light of a recent Supreme Court decision. "[Defendant argues that] a recent Supreme Court decision constitutes an intervening change in the law . . . The Court . . . finds that the Supreme Court’s recent decision in Nautilus, Inc. v. Biosig Instruments, Inc., 134 S. Ct. 2120 (2014) is a basis for reconsideration. Although the case was about invalidity, not claim construction, it bears on the . . . order insofar as claims should be construed, if possible, to avoid invalidity." 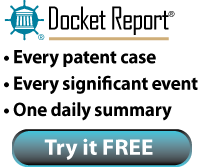 According to data from the Docket Navigator patent litigation database, twenty law firms have the distinction of having represented twenty or more parties in Inter Partes Reviews and Covered Business Method reviews at the Patent Trial and Appeal Board. The top five firms in these post-grant proceedings are Finnegan, Fish & Richardson, Sterne Kessler, Foley & Lardner and Norton Rose Fulbright. The Patent Trial and Appeal Board has instituted more than 60 Covered Business Method Reviews and more than 500 Inter Partes Reviews. The court granted defendant's motion to stay a NPE plaintiff's infringement action pending CBM review because the early stage of the case, lack of undue prejudice, and reduction of the burden of litigation weighed in favor of a stay. "Plaintiff claims that it is seeking to monetize its patent and that Defendants intend to continue selling their accused product during any CBM review. Plaintiff asserts that the stay will prejudice its potential market share even if it prevails in the CBM proceedings. However, Plaintiff has not sought any preliminary injunctive relief to suggest that it has any stake in this case other than alleged money damages, which are available even if this case proceeds after CBM review. Further, Plaintiff points to no actual evidence of its intended operations, or how any such monetization would make it competitive to Defendants." The court granted in part plaintiff's motion to preclude defense counsel from accessing documents marked "confidential - outside counsel only" based on counsel's financial interest in defendant. The court precluded one firm partner from accessing confidential documents because defendants essentially conceded that he was a competitive decisionmaker, but rejected plaintiff's argument that every member of the firm should be similarly precluded. "A crucial factor in determining whether there is a risk of inadvertent disclosure is whether counsel is a competitive decisionmaker. . . . Plaintiff argues that the retainer agreement essentially places [the law firm] in a joint venture with Defendants. . . . The Court appreciates Plaintiff’s concerns regarding the relationship between [the law firm] and Defendants. However, Plaintiff has not cited, and the Court has not found, any authority to support Plaintiff’s proposal to preclude the entire [law firm] from access to its COCO designated information. . . . [T]he relationship created by the retainer agreement between [the law firm] and Defendants is more akin to an in-house counsel relationship than a joint venture. . . . [T]he retainer agreement, alone, is insufficient to confer competitive decisionmaker status on [lead trial counsel]. . . . [I]t is unlikely that [the litigation team] will be placed 'in the "untenable position" of having to refuse [Defendants] legal advice on a host of . . . decisions lest [they] improperly or indirectly reveal [Plaintiff’s] trade secrets.' Thus, the Court finds the risk of inadvertent disclosure by the [defense] litigation team does not rise to an unacceptable level." The court granted plaintiffs' motion to strike defendant's "prior commercial use" defense because defendant did not engage in the prior commercial use. "Plaintiffs contend that [defendant] cannot assert the prior use defense because [defendant] was not under [its current corporate parent's] control at the time of [the parent's] alleged prior use. . . . Defendant does not challenge Plaintiffs’ assertion that [the corporate parent] — not [defendant] — engaged in the prior commercial activity . . . [but] argues that the plain language of the statute dictates that it can assert the prior use defense because [the corporate parent] and [defendant] are presently under the common control . . . [R]eading the plain language of § 273(e)(1)(A) and the overall purpose of the statute, the prior use defense under § 273 is a personal defense, limited to the entity that actually engaged in the prior commercial activity or directed the prior activity or an entity that controls, is controlled by, or is under common control with the prior user or the entity that directed the prior user at the time the prior commercial activity took place. . . . Defendant’s construction of § 273(e)(1)(A) — that the prior use defense also applies to current affiliates who had no relationship to the prior user at the time of the prior use — belies common sense and provides an unintended windfall for after-acquired entities."